I received a call from my sister-in-law the other day with a request for help that surprised me: the church that she and her husband pastor needed some DVDs duplicated. After having spent most of the last year digitizing and getting rid of physical media in our home, I don't even own a DVD player anymore, much less have the ability to duplicate DVDs. 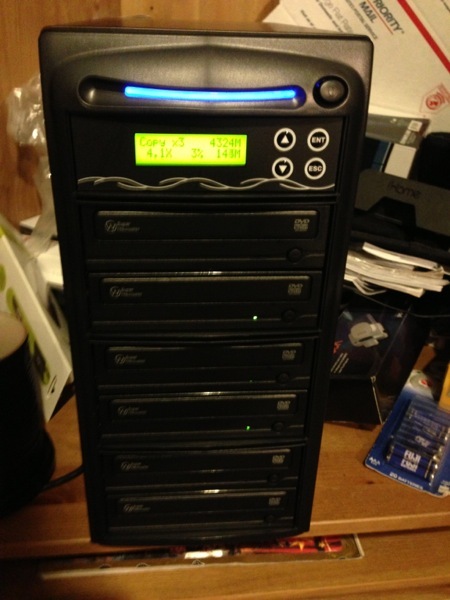 So I reached out to some folks and got one of them to send me the BestDuplicator 5 Target 24X SATA DVD Duplicator - Professional DVD CD Duplication Copier Machine to review . This six drive tower has a single master drive with five targets, allowing you to place any DVD or CD into the top drive and make up to five copies very quickly. I made forty-three DVDs in an evening, and the average burn time was 8.53 minutes for each of 16 masters that I needed to copy. Pretty impressive given that the last CD duplicator I had took more than 12 minutes to copy a 700MB CD-ROM. Operation was dead simple. Drop the source disc into the top drive, insert blanks into as many of the slave drives as you need. Once all the drives are closed, the discs are analyzed and duplication begins. When complete the newly burned discs are checked for accuracy and ejected to be labeled. That's all. No complicated settings, no steep learning curve to make sure nothing goes wrong. While the modern world is going to digital streaming and instant downloads, some applications still call for physical media. I'm not sure when or if I'll have a need for it again, but I know the BestDuplicator will be here and bullet-proof when I do.